We’d love your help. 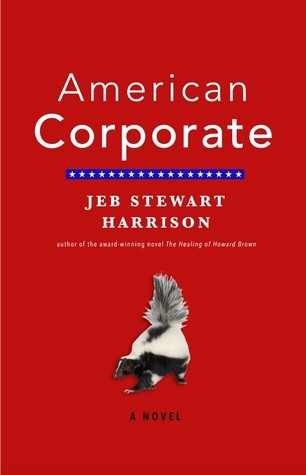 Let us know what’s wrong with this preview of American Corporate by Jeb Stewart Harrison. To ask other readers questions about American Corporate, please sign up. I swear I was laughing from the first sentence of this books straight through till the end. Jack Sullivan is a character with a name that sounds like one you might hear in a spy movie or a super hero flick, but who, in reality is more like the type of character you'd find in a National Lampoon's movie. Jack has not had an easy time of things at the beginning of the book. He lost his job, he's about to lose his house and he's forced to go to an interview for a new job with a noticeable—er, smell. I swear I was laughing from the first sentence of this books straight through till the end. Jack Sullivan is a character with a name that sounds like one you might hear in a spy movie or a super hero flick, but who, in reality is more like the type of character you'd find in a National Lampoon's movie. Jack has not had an easy time of things at the beginning of the book. He lost his job, he's about to lose his house and he's forced to go to an interview for a new job with a noticeable—er, smell. A skunk smell. This is just one of the many situations in this book that kept me in stitches and made me wake up half of the people in my house with laughter. On the other hand, Jack's wife, Carrie has spent much of her life as a housewife and accidentally begins talking to a man online via the Craigslist personal ads because she doesn't fully understand what they are or what she's doing. I think I loved Carrie the most as a character. Her ditzy idealism came across really sweet and cute to me. I really just wanted her to find happiness in her life that she could keep for herself. I'm not sure how Jeb Stewart Harrison managed to create characters and situations that made me burst out laughing one minute and genuinely feel for them and want to see them succeed the next. I really appreciated this author's balance of comedy and sincerity throughout the whole novel. It created a mix that made the book, not just entertaining but also heartfelt and almost life affirming in some ways. I received this book with the request for an honest review. I enjoyed reading it and could easily associate with most of the characters. Having worked in the corporate world for approximately 48 years. Many scenarios and settings in the book came alive as if it happened around me. The dealings and conniving were portrayed very, very realistic. The struggles of Jack and Carrie, with growing children, under the cloud of unemployment and desperation, is known to my own real-life dramas. However, I w I received this book with the request for an honest review. I enjoyed reading it and could easily associate with most of the characters. Having worked in the corporate world for approximately 48 years. Many scenarios and settings in the book came alive as if it happened around me. The dealings and conniving were portrayed very, very realistic. The struggles of Jack and Carrie, with growing children, under the cloud of unemployment and desperation, is known to my own real-life dramas. However, I was disappointed with some use and reference to Jesus to be blasphemous. Apart from that a good read – I finished the book in one and a half days – just couldn’t put it down. My father used to tell just about everybody he met that his son would do just about anything to avoid working. To make him happy I became an artist, and have been involved in a wide range of creative endeavors and have held a variety of requisite day gigs along the way. I like to make all sorts of things. Writing is my bread and butter, from circumcision ceremonies to eulogies, brochures, TV comme My father used to tell just about everybody he met that his son would do just about anything to avoid working. To make him happy I became an artist, and have been involved in a wide range of creative endeavors and have held a variety of requisite day gigs along the way. I like to make all sorts of things. Writing is my bread and butter, from circumcision ceremonies to eulogies, brochures, TV commercials, web pages, articles, essays and novels; if it involves wordsmithing, storytelling and the clever turn of a phrase (with some pretty strong bonus design skills) I'm all over it and, surprisingly enough, get paid for it. I also get paid to play and sing, and have done just that in sleazy bars and concert halls all over the Bay Area. And if that weren't enough, I paint the spectacular local landscape and even get paid for that too (though I'm more prone to give them away). My debut novel, Hack was published by Harper Davis publishers in August 2012. My second novel, The Healing of Howard Brown, was published in August, 2016 by Baby Bingus Books, and is the winner of the 2017 Independent Press Award for Literary Fiction. My latest novel, American Corporate, was published around Xmas 2018. I graduated from MFA Writing Program at Pacific Lutheran University in Tacoma, WA. In my off hours I am a semi-retired marketing communications professional, recently with with a little outfit called IBM, and later with McKinsey & Co.